Life For Animals: The Brutal Killing of Leopards Continues . . .
A leopard, that had no past record of attacks on humans, was cudgeled to death by a mob in Garhmuktwshar, near Delhi, even as forest department officials waited for a tranquilizer dart fired at the cat to take place. 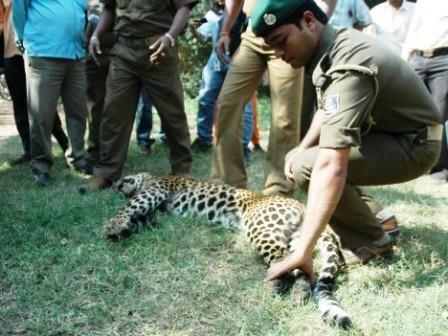 The leopard had earlier seriously injured two policemen and had caused minor injuries to five of the hundreds of villagers surrounding the cat. The cat had been trapped by a mob in a sugarcane field. According to the chief of the Wildlife Protection Society of India, Belinda Wright, as many as 78 leopards have been killed this year alone in incidents as diverse as poaching, road accidents and killings by villagers. This proves the drastically low levels of awareness and sensitivity of the masses about these wild animals. They still seem to live in the sixteenth century when these animals of the wild remained a mystery to the people and were perceived as a major threat to the mankind. We need to educate people about how these fellow companions of humans are needed to save the ecosystem and ultimately the earth. We need to run awareness campaigns for these people who would corner, attack and kill any wild animal for the fear of life, sheer excitement or fun. We also need trained forest department staff to handle incidents involving all jungle cats. Besides, Mobile leopard rescue teams are absolutely essential and needed. Wild animals stray into villages for the search of food and this has happened because of the rampant deforestation and their natural habitat being destroyed. Everybody knows that wild animals want to be left alone and live their life peacefully. So why not to leave their forests and them, alone?